The continual rise of food intolerance/sensitivities and food allergies around the world is frightening for warehouse managers. There is increasing vigilance in protecting consumers from allergic reactions. Adhering to these guidelines can prevent costly product recalls and potentially food allergy law suits. It is not very likely that the market sales for gluten-free packaged food will ever catch up to sugar-free beverages, but it may in fact catch up to the lactose-free dairy market and has actually surpassed the declining low/no/reduced-carb market. 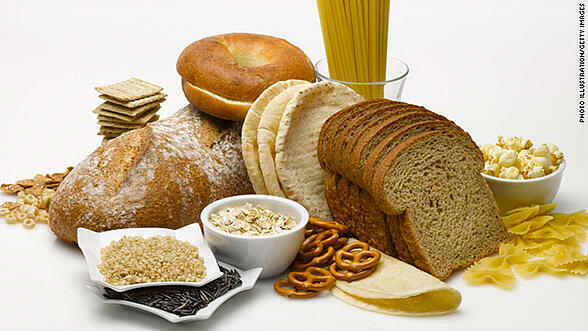 Gluten is a protein found in wheat, rye, barley or any of their crossbred varieties and derivatives. In baking, gluten is the binding agent within the flour that prevents the baked good from crumbling. As such, gluten is found in many processed and packaged foods. Allergy: When referring to food, an allergy can be defined as affecting the immune system and having an immediate reaction upon ingestion. The main step required to avoid this reaction is to eliminate the offending food(s) completely. Common food allergens include: eggs, milk, fish, peanuts, shellfish, soy, tree nuts, and wheat. Intolerance: A food intolerance can be defined as affecting the digestive system and as such, it typically takes longer for a reaction to occur. The main step required to avoid a reaction is to eliminate the offending food(s), or to moderate one’s consumption of it. Common offenders include lactose (from milk-based products). A few years ago, gluten-free products were virtually unheard of except in specialty health food stores. Now, it’s become more difficult not to see some gluten-free product featured in regular supermarkets and hypermarkets. In some cases whole aisles are dedicated to gluten-free packaged foods, along with other specialty foods such as diabetic and lactose-intolerance foods. Globally, around 20% of consumers in a Datamonitor survey said that they avoid certain foods due to an allergy or intolerance most or all the time. A further 22% claimed to do this occasionally. This is a large worldwide market for many companies wishing to launch intolerance and allergen-free products. According to Datamonitor, those who are influenced by gluten-free claims are healthier eaters, more ethical, experimental and more influenced by natural and organic ingredients than the average global consumer. Consumers in the 50-64 and 25-34 age ranges in North America are also more likely to be influenced by gluten-free marketing. Males are also more influenced by gluten-free marketing and claims than females, in North and South America. Celiac Disease (CD) is an inherited, autoimmune disorder that damages the small intestine while a gluten intolerance or sensitivity to gluten is an adverse reaction in which proteins from the grains wheat, rye and barley (collectively called gluten) damage the small intestine. The only treatment for CD is a strict, lifelong gluten-free diet. With a prevalence rate of about one in 133 people worldwide, between three and four million North Americans have the disease, but it is estimated that only 5% to 10% are currently diagnosed. Read about the symptoms here. Christopher Harper suffers from ulcerative colitis, an auto-immune disease affecting the bowel, and he says eating gluten-free eliminates a lot of the symptoms.He says as long as you make the right choices, the variety of food available for sufferers is out there. “Cooking at home with whole ingredients is a sure way of achieving this,” he says. A very diverse group of consumers purchase gluten-free products. The main group includes those with celiac disease (CD), for whom a strict gluten-free diet (GFD) is the only treatment for managing the disease and reducing the risk of other complications. However, what is important to note is that gluten-free products may be purchased by those with a wide variety of other conditions, including non-celiac gluten sensitivity, wheat allergy, autism, ADHD, multiple sclerosis and irritable bowel syndrome (IBS). The following is a brief review of the conditions for which gluten-free is applicable. 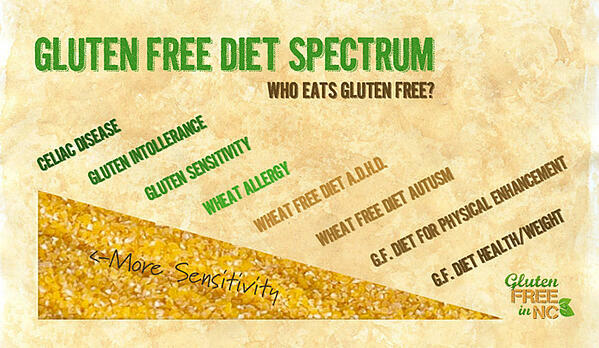 It is possible to be intolerant to gluten without having CD or a wheat allergy. Individuals may have similar gastrointestinal symptoms as those with CD, but no damage to the intestinal tract nor will they develop complications associated with CD. It is not known how many people have gluten sensitivity, but a growing number of individuals are being identified. The high risk associated with allergen contaminated products means that there is a constant stream of companies recalling products with infringements due to allergen contamination or mis-labeling. Although food manufacturing companies may state that they simply do not/cannot cater for the gluten-free market, are they missing on a market who is simply asking for certain ingredients to be excluded? "Sales of products with a gluten-free label have doubled in the past four years" according to Fortune as of May 2015. This may be due to the fact there is a better knowledge of what gluten-free is and/or/as well as the availability of gluten-free products where previously none existed. So rather than excluding this consumer, why not offer alternative products in the same way that instead of excluding health conscious consumers - major fast food companies are offering healthier alternatives. Is this not the best way to keep ahead of the pack rather being left behind? The consumer will praise you for it and more likely to encourage brand loyalty. If you are in the gluten-free market, your warehouse should develop, document and implement strict procedures for controlling specialist food in your production and storage facilities. 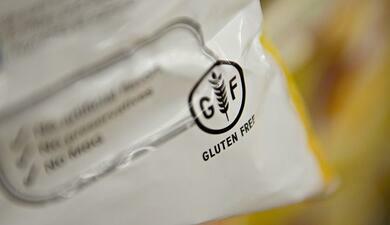 Gluten products must be segregated from gluten-free products. 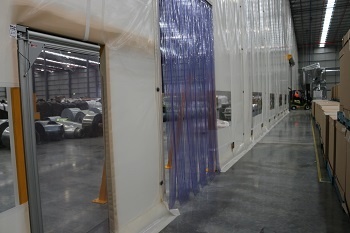 This can be achieved by Flexwall Dividers / Dividing screens as well as more permanent warehouse layout options. You should also have storage racks or areas designated for gluten storage clearly labelled. If you are storing both gluten and gluten-free on the same racks, the gluten containing materials should be on the lower racks. Also, allergen foods such as peanuts in mesh bags or eggs in cartons can provide large risks for contamination by falling on items below. Following such procedures should restrict top down contamination. You should also attempt to never store two different allergens on the same set of racks. Consider everything involved in the storage of your product because even the little things such as the corn starch used in packaging can cause an allergen contamination risk. Warehouse personnel should be trained in moving allergens/gluten from loading docks to the dedicated storage areas. It is also essential that your team are aware of the urgency of cleaning spills immediately and thoroughly. Allergens can easily be spread throughout the warehouse on the wheels of forklifts, trucks or even the shoes of workers. Some warehouse managers even require their team to wear different colours depending on what allergen they are working with. While this is expensive it ensures that there is no cross contamination from clothing. Basic education on allergens and food safety would also help in providing the underlying reasons for your allergen avoidance procedures. Positive Pressure can be most useful when you have product that is exposed to the air such as particles or grains. By creating positive pressure (having more air entering the controlled zone than exiting) in your allergen free zone you can greatly decrease the risk of contamination from airborne particulates. This protects your product from cross contact but also foreign matter. Specialised swing doors are used in Hospital environments for this very purpose and should also be considered in warehouses. Remax Swingdoors are up to 50% lighter than a standard timber door, less likely to harbour mould and bacteria due to their construction and will never require painting and maintain critical positive air pressure. If you need open doors you can still maintain positive pressure by using products such as air curtains. 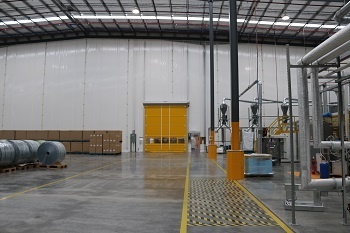 And from a business perspective, a temporary wall may be the perfect solution if you are looking at segregating production for a certain period of the year or renting a site where you do not want to or cannot spend money on a permanent wall solution. 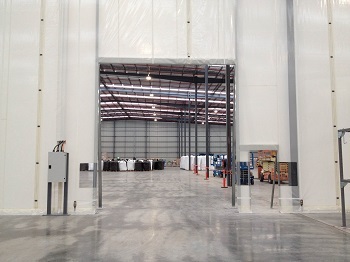 Flexwall factory and warehouse dividers can be rapidly deployed to accommodate changes in production lines, and can be fixed to almost any structure, as a durable and attractive temporary wall, or hoarding, fitted around protrusions such as service pipes and ducting and any type of door can be incorporated as required. From the industry leading, ultra smart Remax Movidor High Speed Doors, Fire Exits through to a simple PVC strip curtain and everything in between, Remax can provide a door solution that incorporates seamlessly with your Flexwall project. Now that we have covered a snippet of working with a gluten-free warehouse, here is some information to help you deal with cross-contamination of gluten-free products at home, click here.